The man spoke to me with a smile and a quizzical look, “Were you really crying up there on stage?” I assured him I was crying during my speech. He just laughed and I looked over at Amy Edgar. A knowing look passed between us. He doesn’t understand. He doesn’t understand the pain; nor the tears of pain remembered. But Amy does. I met Amy Edgar in Vancouver at Collaborating Across Borders IV conference. She lives in Pennsylvania and works at Cedar Crest College. She is an assistant professor of nursing. 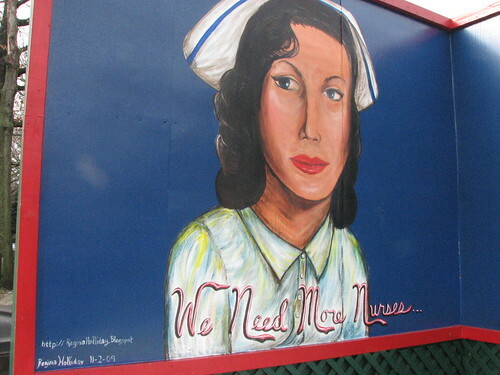 I am sure there are many stories she could tell from the world of nursing, but this painting is about her daughter. This is “Gown of Tears” the painted story of Sara. I ask you to look in the face of this girl. I ask you to see the hurt in her eyes, the deeply broken trust. On December 31, 2006 ten year old Sara fell. It was a small thing, she was soaring over her sister as children are wont to do. She hit the edge of a hardwood stair and screamed in shrill animal pain. Amy rushed to her and checked for breaks. It looked like it would be a very bad bone bruise. Amy gave her ibuprofen and iced the injury as an ER trip on a holiday is to be avoided, but after a day in anguish they left to get an x-ray. There wasn’t a fracture so they were sent home again with Sarah in excruciating pain. Amy scheduled an ortho follow-up. An MRI determined a hairline fracture. Percocet was ordered to combat Sarah’s pain. When that did not work Vicodin was ordered. Then Valium and Vicoprophin were added to treat the pain of this 68-pound girl. Next the pain began in earnest. It radiated down Sara’s leg, the slightest touch would cause scream of utter agony. Amy began to look for anything that might help her daughter. For the first time in her life Amy would hear the term “Reflexive Sympathetic Dystrophy” or RSD (it is also called Complex Regional Pain Syndrome). This disorder causes a central nervous system closed loop consisting of a pain pathway that never stops firing. Amy found out that statistics give patients a 10% chance of healing without pain. Amy read that up to 75% of children with RSD attempt suicide. For weeks Sara lived in a litany of pain barely contained by strong narcotics. Then the true hell of physical therapy began. Here, I begin to cry with Amy for I know that hateful dance. In my mind’s eye I see my late husband Fred, suffering in pain as cancer ate him from inside, being told to work through the pain and just take a step. So Sara danced the dance, and Sara screamed. She screamed so long and so loud that they were asked to leave by the therapist. At the next session Amy was accused of babying her daughter. Sara’s pain now radiated from her toes to the top of her thigh. Her skin mottled she would scream herself hoarse during treatment. The family was sent to another treatment facility. They hoped for treatment and respite from the pain. They were only to hear a careless doctor through the flimsy wall say, “ Oh Great RSD… what do they want ME to do? Fix it?” His recommendation was more physical therapy. Amy began to despair. Now the accusations began. The doctor accused Sara of making this up to get attention. Amy had never felt so betrayed by her profession. The family went home in defeat. Sara’s little sister began having nightmares. Sara stopped eating. Sara stopped smiling. She had not used her leg in six months. Amy began searching the internet for centers of excellence in treatment of RSD. She found Cincinnati Children’s Hospital. They family arrived numb and prepared for another failure, but the team atmosphere amazed them. Sara was assured that therapy would only begin when the pain was under control. Sara was given an in-dwelling epidural and three weeks of intense therapy. The family was fracturing under the stress of missed work and school. At the end of week four Sara left on her own two feet. They were saved. But Amy works in health care. Each week she sees people and their pain dismissed. She sees wives and mothers pushed aside and labeled non-compliant or little Miss A-type personality. Well, Amy is doing something about it. She has joined the Walking Gallery and she will wear “Gown of Tears” in the hallowed halls of medicine. My dear friend, thank you for sharing Sara's story. 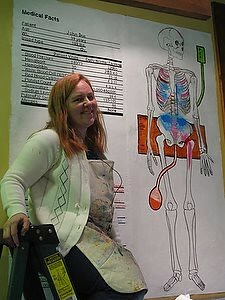 By wearing this painting into hospitals, I am able to bring her pain into the conversation so that it might help others. After Sara recovered, we agreed to work hard for change. This represents another step in our journey.. I am so proud to be part of The Walking Gallery! I am so honored to paint the story of your family. Thank you for all you do Amy. Why do so many diagnoses of rare diseases have to run this kind of gantlet in the healthcare system? Very sad. I often think the greatest "miracle drug" that could ever be applied to medicine would be to listen to people when they talk about their pain and truly try to help them get better. We could do so much by just trusting each other. I am amazed by the strength exhibited by this young girl. I can only hope that her family can share Sara's story to help other families who struggle with this disorder. Thank you for sharing her story. The strength that Sara and her family showed was truly amazing. Even after multiple misfortunes they never gave up. This painting was not only able to speak volumes for Sara and her family but also created a gateway for others going through pain and hardships. Everyone has a story and now Sara and her family can express that not only to themselves but for others as well by being part of The Walking Gallery. It's amazing how strong she was. It's so great that they were able to find someone in the end to help her so wonderfully; many would have given up after the first few doctors. It's horrible how the doctors were so dismissive of her condition! Unfortunately too many doctors are like that nowadays. It's a wonderful thing you are doing, making people aware of these stories in an effort to help improve the doctor-patient relationship.